While enjoying an end of year get-together with the entire John X Team, we took the time to reflect on the year that has been. Gauging from the excitement levels, each tracker or PH wanting to tell his story first, it’s hard to miss the tell-tale signs of a great season. This year saw us hunting a variety of new areas, while maintaining our established concessions throughout South Africa and Mozambique. A couple new faces joined our team, while we bid farewell to Gary and Lee, who will be embarking on an exciting venture of their own. We wish them all the best! In South Africa, our northern areas, as well as the coastal region, recorded the highest rainfall in over sixty years. While one would expect the lush coastal areas to be booming with growth, it’s the drier Karoo that has seen the greatest metamorphosis of all. Game have thrived over back to back seasons of prosperity, allowing our hunters to enjoy breath-taking scenery and regular opportunities on world-class trophies. Mozambique has once again proven why it’s fast becoming the most popular Buffalo destination in Africa. Through the continued support of our hunters, we’ve seen a remarkable growth in game numbers, ensuring sustainability through responsible utilization. This particular term is one often used by us, and most certainly one we live by. But when one considers a Buffalo census done in our Mozambican area in 1994, which delivered a count of +-1400 Buffalo, compared to the census completed a mere 10 days ago, counting just over 18000 Buffalo – we’re extremely proud of that number, and you as hunters, the true conservationists, should be too. It goes without saying that a season like the last would not have been possible without the people involved. To the entire John X Team – It’s been a privilege sharing days with you in the field, at the office, in the lodges or on the track of a weary old Dagga boy making his final stand. Thank you for the early mornings, late nights and long days – we’re not only showing the world who we are and what we’re about – we’re living it every day through our passion of making John X Safaris not the biggest, but certainly the best. Lastly, to our valued hunters, the people who have made it all possible, without you there would be no stories to tell or dreams to follow. 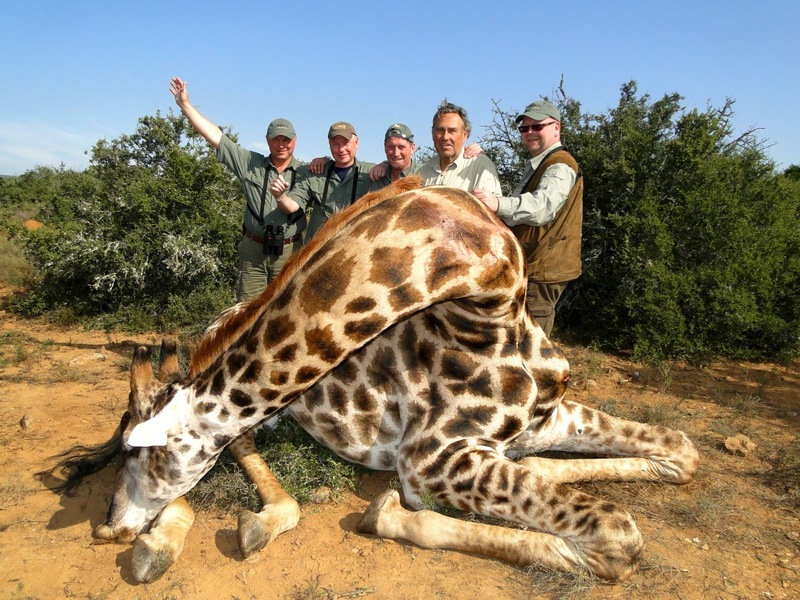 You have all toiled away pursuing a particular specie/s, hoping to hunt that dream trophy. After hours of debate, the PH’s have selected a few favorites from the past season. We apologize in advance if we may have missed one or two monsters; at no stage was that our intention. This is a celebration of you and your safaris, and the lucky ones who found themselves in the right place at the right time. Where else to start, but with the all time favorite? 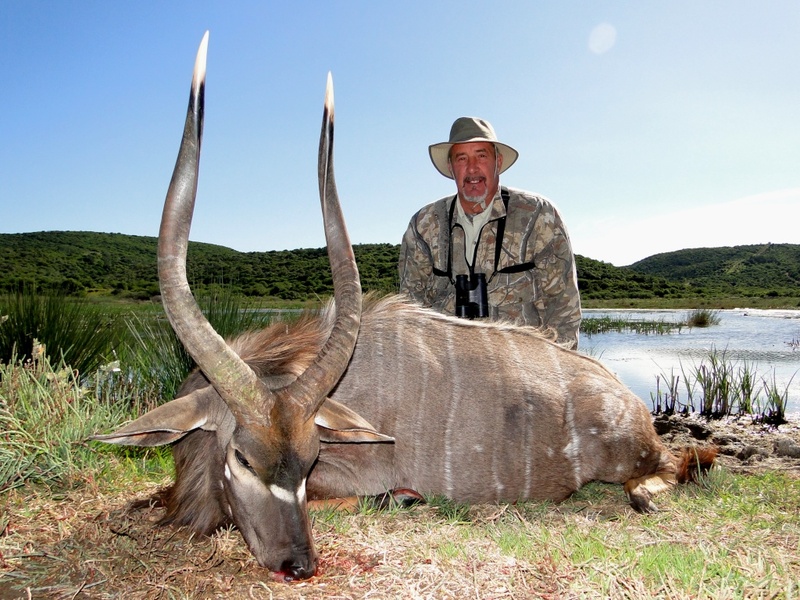 Over the course of the last 29 years John X Safaris has built up a proud reputation of quality East Cape Kudu – year in and year out. This year saw two main contenders for bull of the season. We leave the decision up to you. Elizabeth Stout, together with her husband, Pete, headed out in search of Warthog on the last day of their safari. 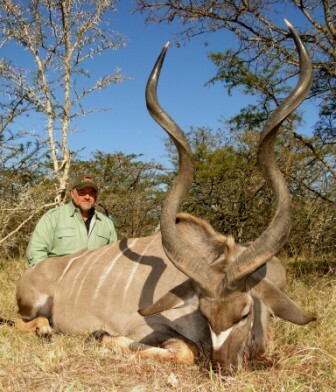 Pete had already hunted hard for his 50’’ bull, and achieved it with all odds stacked against us with thunderstorms and rain dominating his Kudu hunting days. When this bull stepped out instead of a Warthog, it took some convincing. 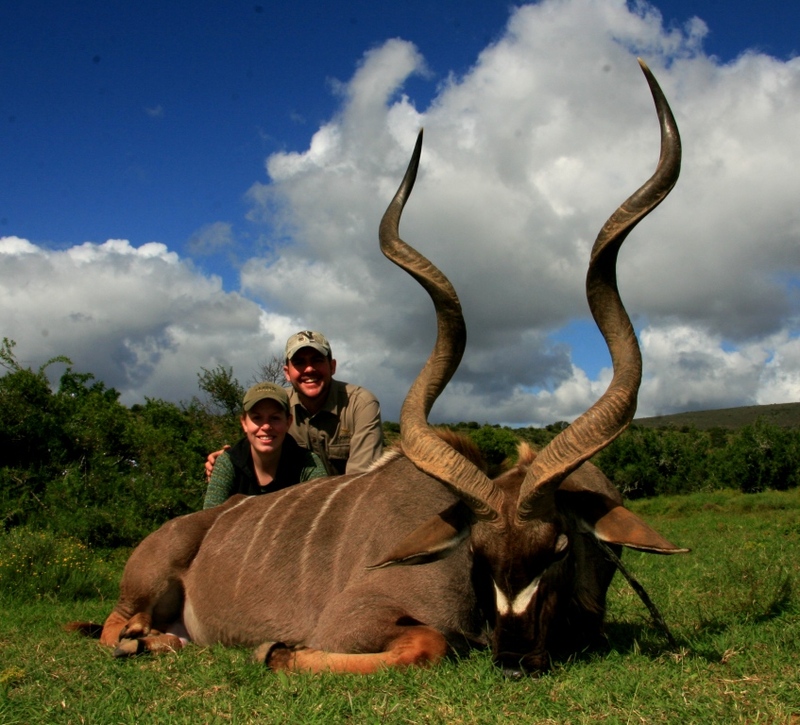 Thank goodness Elizabeth chose her Kudu! It proved to be a certain highlight for 2012 coming in just shy of 54’’. Steve Barry’s bull clocked in at 55’’. 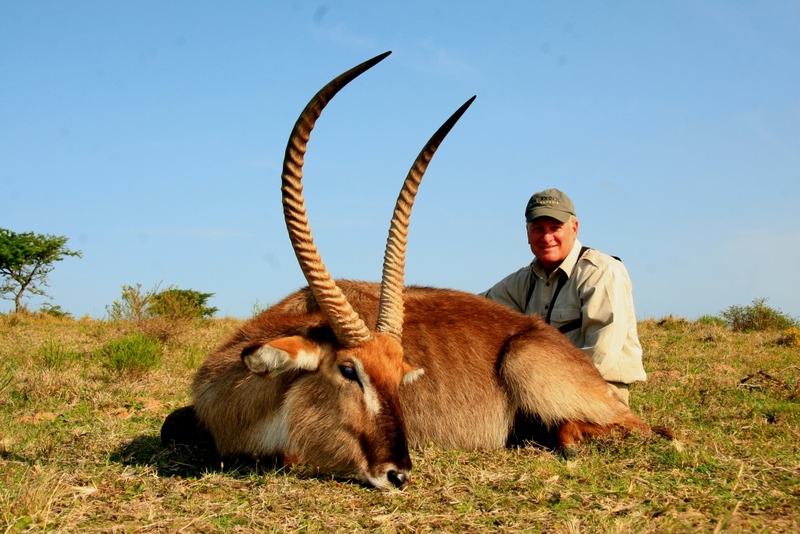 He came on safari dreaming about a big Kudu, we reckon he got a monster out-and-out. 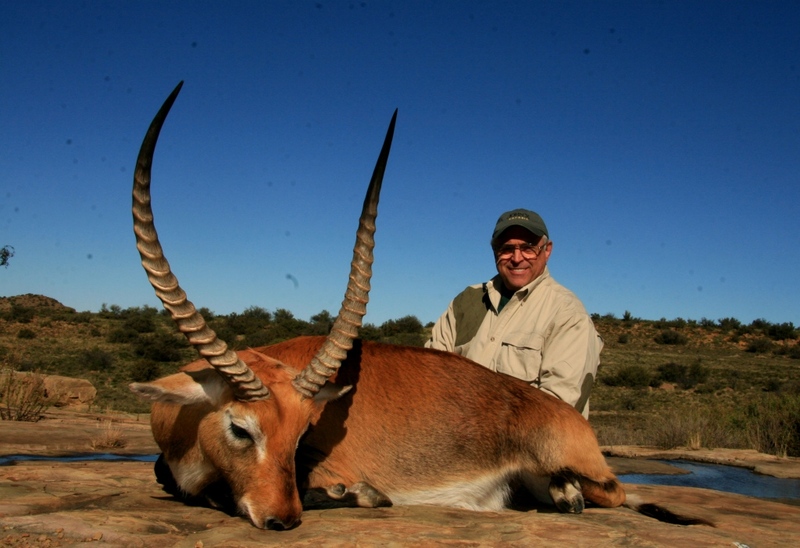 Vaal Rhebuck are considered by many as one of the hardest trophies in South Africa, with many hunters returning year after year in pursuit of these mountain dwellers. Our good friend Johnny Posey has most certainly done his time in Africa, returning on his 3rd hunt with John X Safaris during 2012. We could not have wished this monster on a more deserving man than Johnny. Well done on your great ram mate! 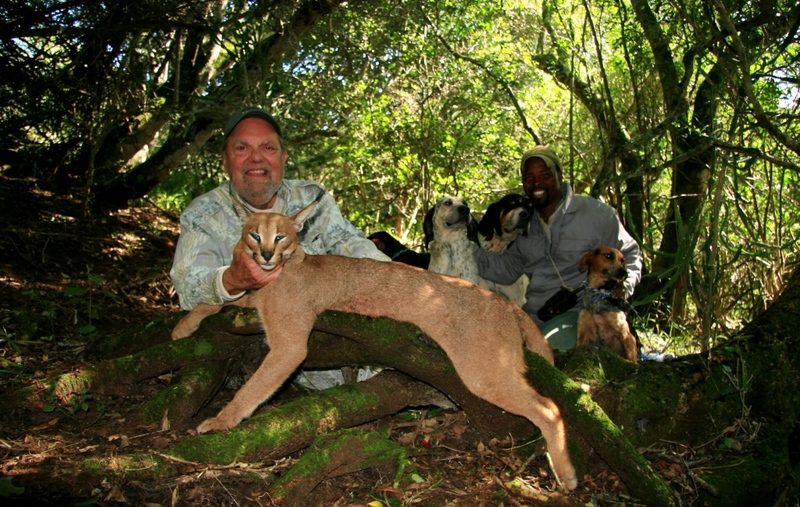 Our Caracal/Lynx hunting with hounds continues to be one of our most popular. We hunted a number of cats this season, but it was not until the last safari of the year that we really hit the jackpot with a huge tom. David Combs proved to be the lucky hunter. Our Springbuck slam, consisting of Common, Black, White, and Copper Springbuck, continues to be a winner amongst our hunters, with many deciding to pursue all four color variants on the same safari. 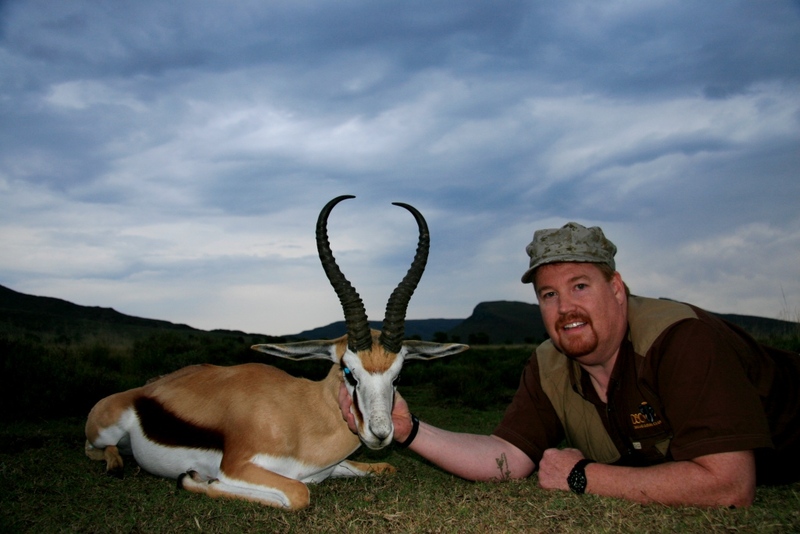 The Common Springbuck of 2012 – were ridiculous. This was the hardest category to select. So many great rams were hunted during the season, but in the end it came down to this unbelievable ram by Steve Travis. Steve’s ram came in at 17” with heavy bases and a great shape. We reckon with our current management structures in place we’ll be seeing rams of this quality in the future, but that will be in 4-5 years time – for now this is as good as it’s ever been. 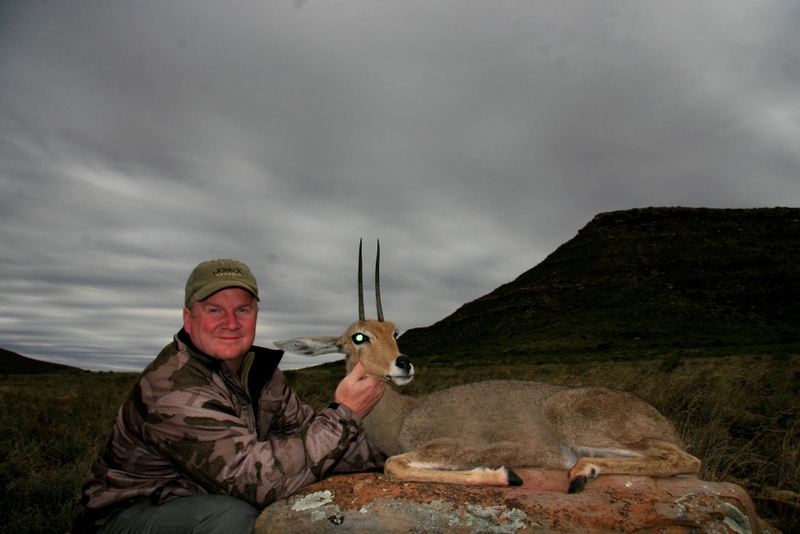 The Black Springbuck weren’t far behind either, with Shelley Arnette bumping into one of the best of the season. Shelly’s PH, Greg Hayes, was pretty adamant this was one of the most beautiful rams he’d seen in his 20 years of guiding – we all tend to agree! 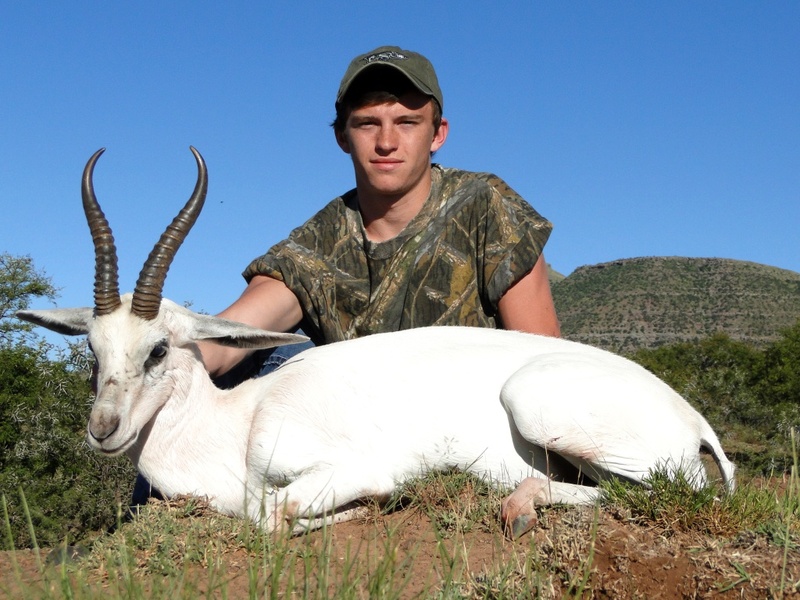 Hunter Thorpe hunted his superb White Springbuck during early season, earning him the white ram of the year. The Copper Springbucks popularity keeps growing in leaps and bounds. This year saw us hunting eight rams, the most of any season to date. Tom Hoffman hunted this great specimen from our northern area, completing his entire Springbuck slam. Coming back to the spirals, our Nyala only seem to be getting better and better each season. 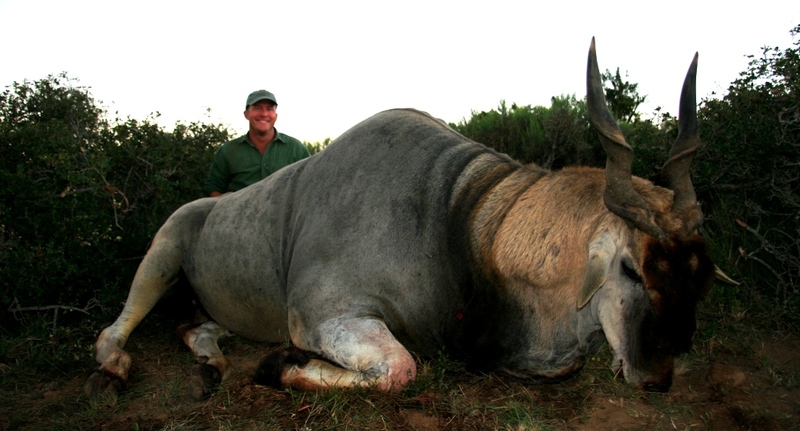 This particular bull was hunted in September by Paul Majeroni. Paul hadn’t planned on hunting a Nyala on his first trip to Africa, but who could have blamed him for changing his mind when this superb 29” bull stepped out. Our junior hunters continue to be some of our luckiest. 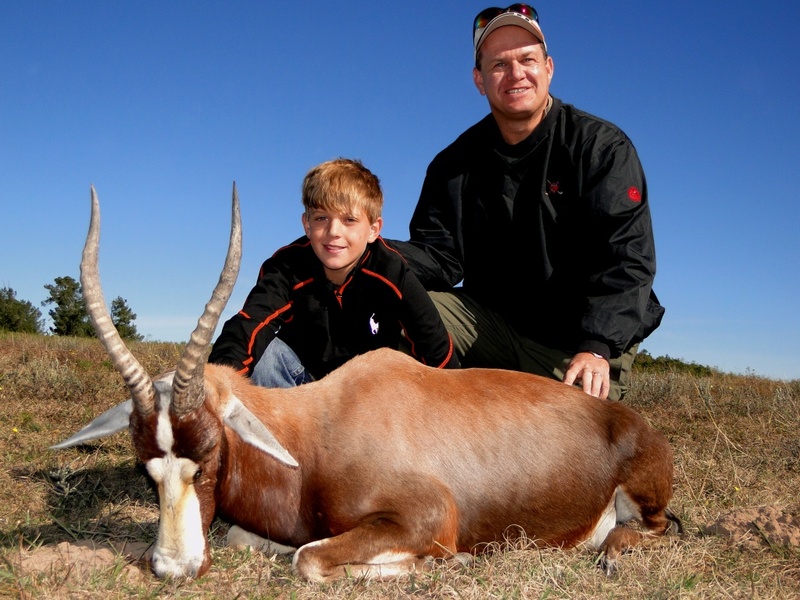 We first met Hunter Arnette at the Dallas Safari Club show in 2010, where as a confident young man he walked up to the John x booth and told us a Cape Hartebeest was his priority trophy when his family would be joining us on safari during 2012. Now we didn’t plan this – Hunter just had his stars aligned. 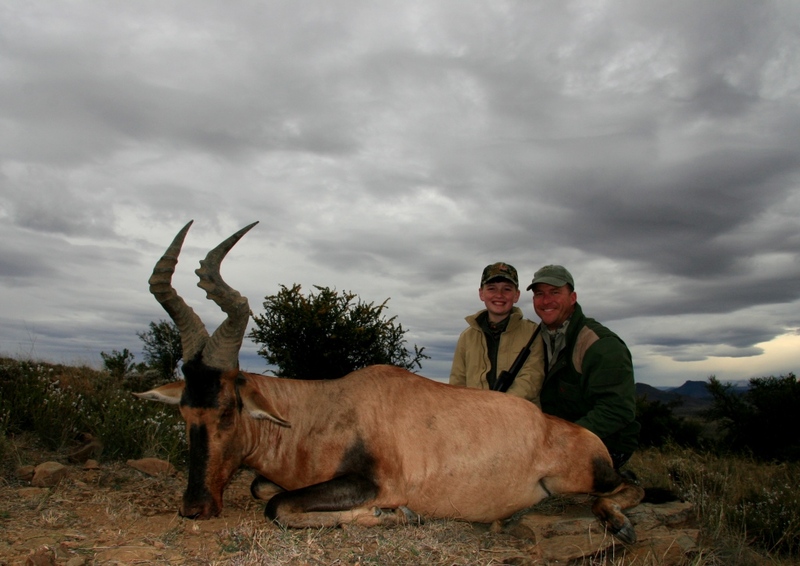 How else can one explain the size of his Hartebeest? The biggest in over 5 years. Waterbuck continue to be the fastest growing specie in quality throughout our areas. Dave Sinclair was another one of those hunters who couldn’t help himself when out stepped this 32” monster! 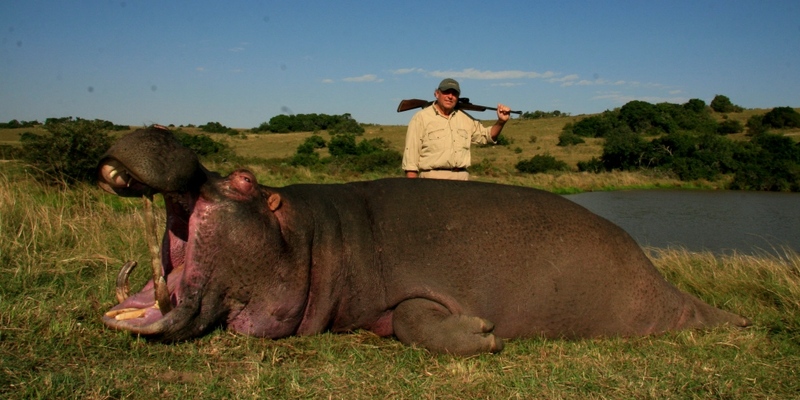 The Hippo of the year was hunted by Lennart Packendorff – a whopping 26” bull. A number of Cape Buffalo were hunted during the course of the season, some bigger than John Nowlin’s, which he hunted with us in Mozambique. 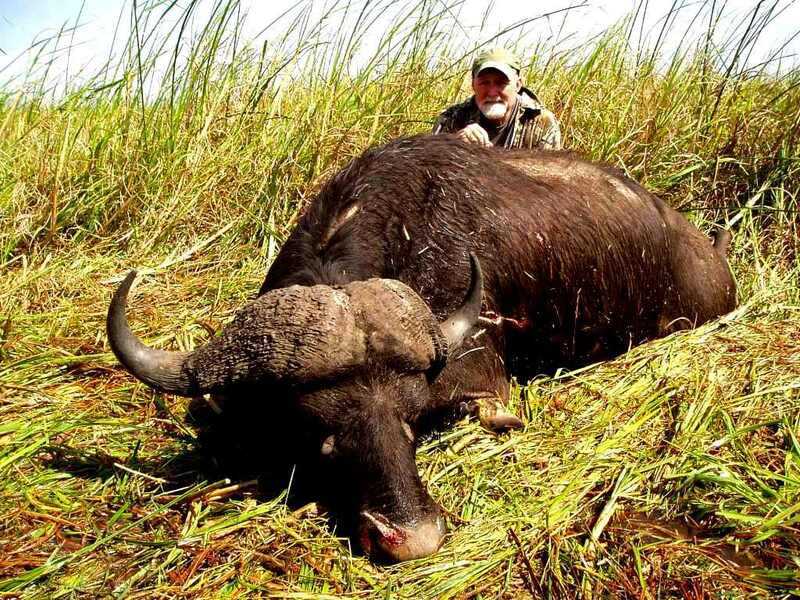 But John’s history with Cape Buffalo and the sure tenacity of his bull not wanting to quit, very similar to John’s previous bull, saw him walk away with Cape Buffalo of the season. We just love those solid bosses forming a helmet on top of its head. Sticking with the big ones. Our partying Swedes are never to far away from the action! While the bull hunted was a beauty, it was the experiences that followed that provided the memories to last a lifetime. While the guys were getting the bull ready for a picture, Professional Hunter, Juan MacDonald disappeared for a period. Upon his return he presented Lennart the greatest gift of all, a Giraffe hair bracelet, made from his very own Giraffes tail hair. Now there’s one to remember! 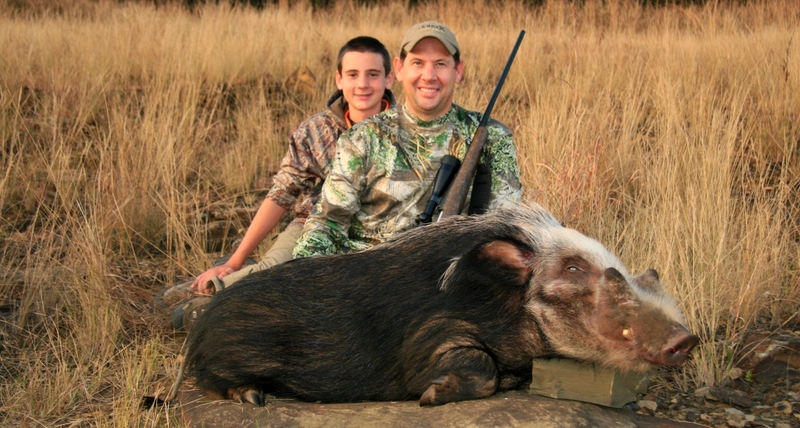 On the Bushpig front we had another memorable year. It seems our Bushpig hunting has become legendary, with many hunters requesting the opportunity of pursuing these sly beasts. As hard as we hunted, with 90% of our success coming over bait at night, it would be none other than our good friend, Steve Robinson, who would go against all odds, hunting the monster of the season at four in the afternoon! 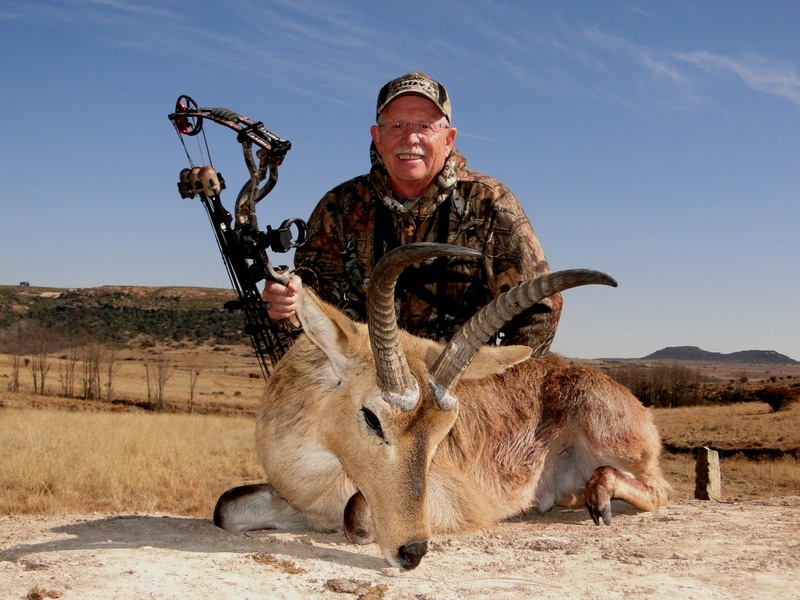 The bow hunting department has been dominated by Jim Haselberger over the past 3 seasons. This season proved to be no different. We have no doubt he’ll produce the results upon his return in 2013 once again. Dave Kjelstrup was back again this year, picking up from where he left off last year. This time earning the Lechwe of the season. Apart from the many friends we meet, the breathtaking areas we’re privileged to hunt, and the trophies that leave lasting memories, there are occasions in our industry where one has to pinch oneself just to realize how lucky we are. One of the greatest highlights from 2012 was the return of Jeff Fester and his entire family, and most importantly, his son Tommy. You see Jeff, together with old Fred Slater, were John X’s first ever American clientele, more than 25 years ago. Imagine our excitement when Jeff notified us that it was time for Tommy to join the John X Safaris family. 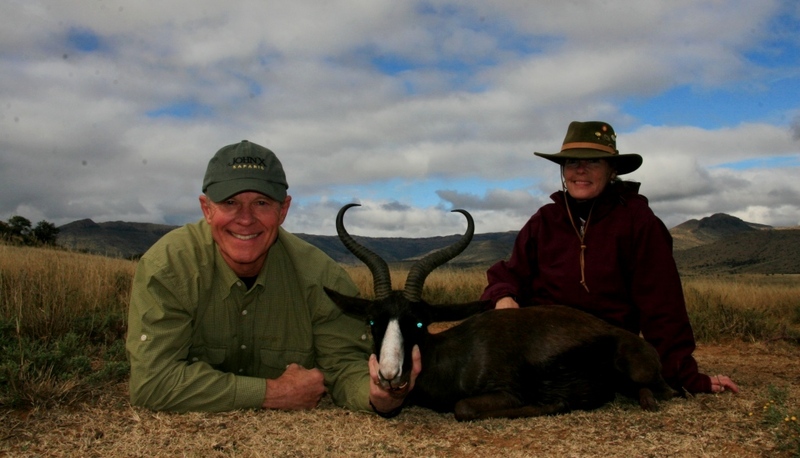 That’s a second generation Fester hunter, hunting with John X Safaris under its second generation ownership. Surely that’s as good as it gets! Every year there are a number of trophies that come within reach of that “trophy of the season” tag. This year has been a difficult year to make that call, considering the stiff competition already mentioned above. The average was exceptionally high, probably the reason why we have two possibilities for “trophy of the season”. We’re not sure who outdid the other? We’ll leave that for you decide….. 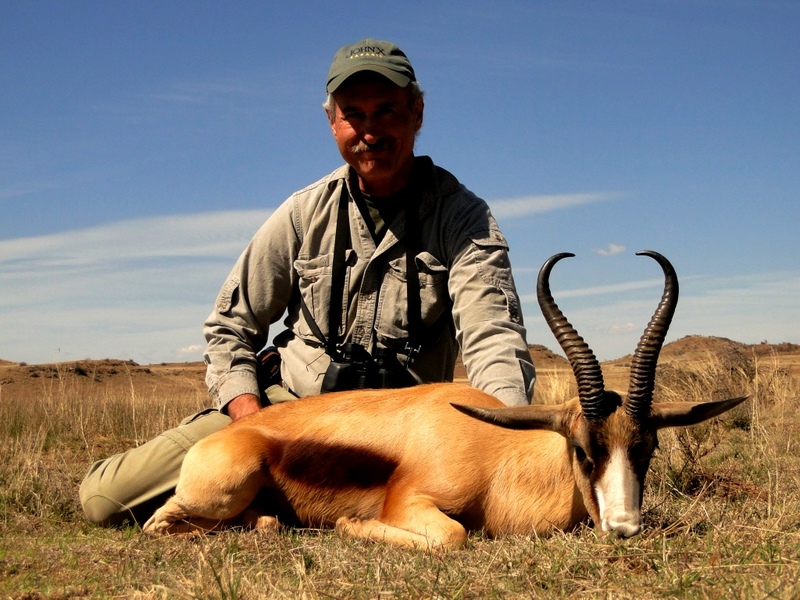 When we first spotted Eric Arnette’s Eland, we knew it was special. 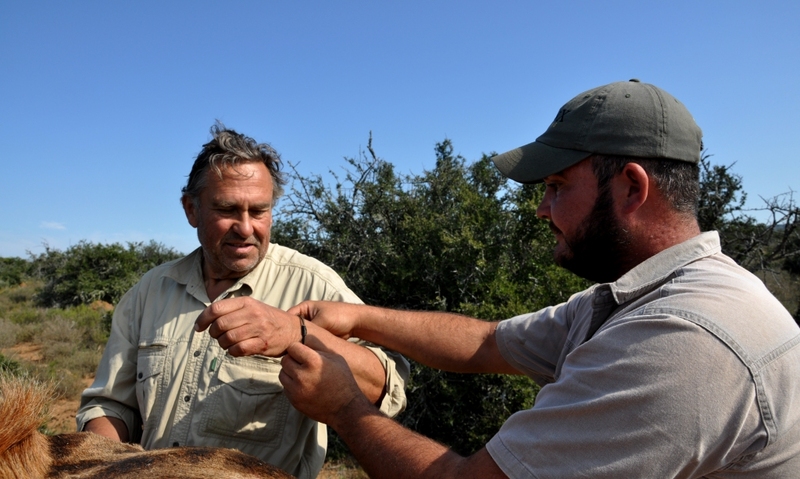 The hunt was hard, all day on the track with a single bottle of water to share between Eric and Professional Hunter, Carl van Zyl, and an average temperature of 30 degrees Celsius. When it came time for Eric to make the shot count, he did it with precision, at a time when it mattered most. Walking up on the downed bull rates as one of the highlights in Carl’s career. The old warrior possessed the steel-blue tinge that few carry, the heavy dewlap, protruding horns as blunt as daggers, and the dark mop of hair forming a dominant fringe on its forehead. Most impressive of all was his sheer size. He weighed in at more than a ton – broke the land cruiser, literally in half while loading, and made a winch and six grown men buckle under his weight. He was without a doubt one of the monsters of the season. Our second recipient is a young man we’ve all got to know well over the course of the past three seasons. First and foremost – he’s a gentleman, a true sportsman, and an addicted hunter – his parents appropriately named him Hunter. Hunter Robinson has come to hold a special place within the John X Family. He’s the luckiest kid you’ve ever met. Our good Mexican friend, Jose, keeps telling us no matter what we do or how we plan it, Hunter will always outdo the rest. We’ve learnt to agree with him! Perfect in every way? 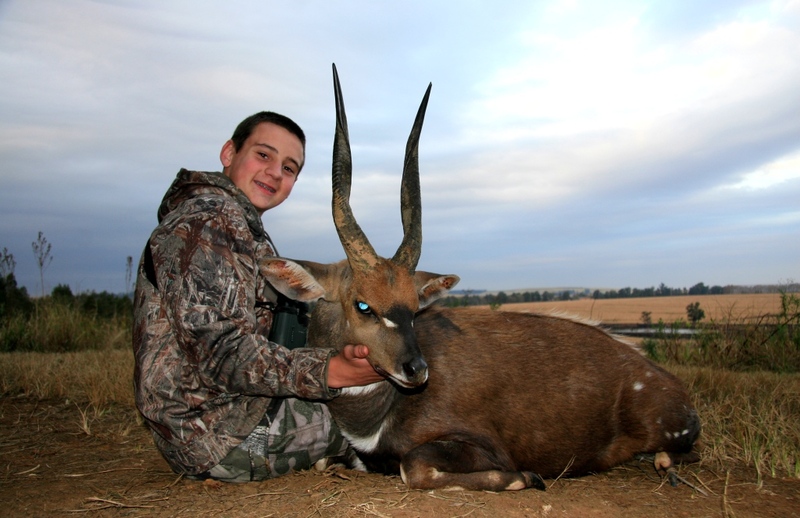 Hunter Robinson and his Cape Bushbuck of a lifetime. Words cannot describe the envy from fellow hunters who’ve seen this picture ever since our hunt in July. Another job well done young man – Can’t wait for our next adventure! This year not only saw our teams do an outstanding job in the field by achieving another season of first class results, our marketing and communications team were hard at it too. After the amazing success of John X Safaris’ first Coffee Table Book during 2010, we backed it up with another in 2011. This season we’ve continued on with the popular tradition. Furthermore, our John X Blog and Face Book Fan page have grown from strength to strength with over 2500 subscribers per month. 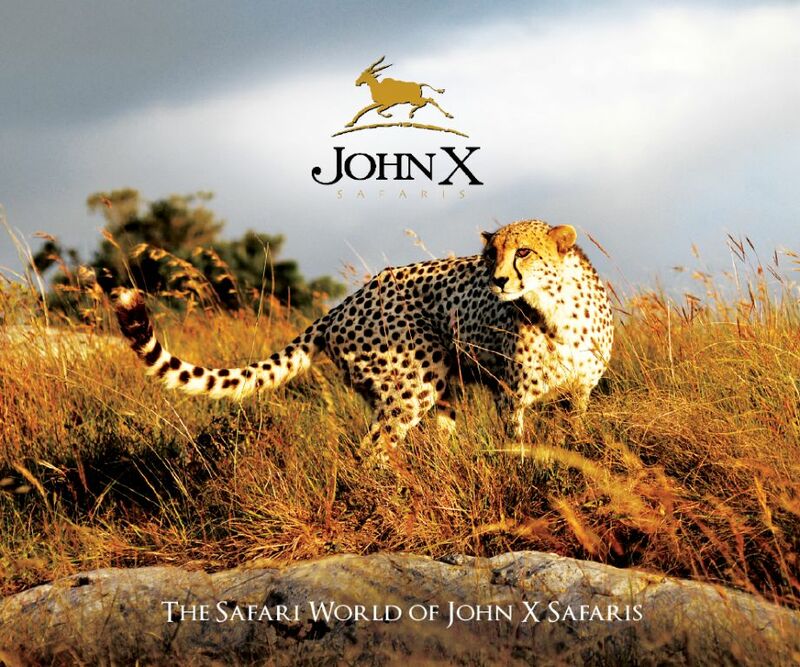 The new John X Safaris website is the latest edition to the Safari World of John X Safaris. We can proudly say this addition has set us apart from our competitors, ensuring you, the traveling hunter, can find the latest and most comprehensive information at a touch of a button on www.johnxsafaris.co.za In saying this we would like to make special mention of Heather Lantz, Heather has been the heart and soul behind our new site, without her dedication and expertise we would not have been able to be where we are today. Thank you! Go along and have a look at our new site – it has revolutionized safari updates, trophy pictures and safari videos. It’s most certainly the first of its kind. 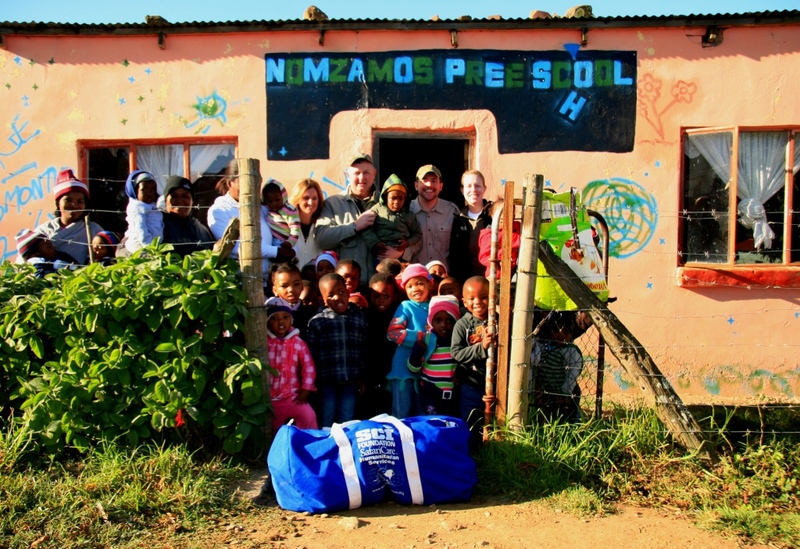 The John X Safaris Humanitarian Initiative came on with leaps and bounds during 2012. Through the support of our hunters we were able to take our commitment to our local community to the next level by establishing the John X Foundation. We would like to thank and commend the following people who’ve been a part of our Humanitarian Program during 2012 – The Barry Family, Arnette Family and all the staff from the Texas Cash store in Texas, Chris, Martie and Autumn Petersen, Dave Kjelstrup, Pete and Elizabeth Stout, and Thom and Ellen Manning. Without your generosity and support we would not have been able to achieve the programs goals during 2012. Thank you! Looking towards the future and 2013, we look forward to seeing as many of you as possible during our upcoming travels. Below is a quick reminder of our 2013 Show and Travel Schedule. If you or any of your friends are interested in meeting with us, please drop us a line, we’d be glad to fit you or them into our schedule. To each and everyone who joined us on safari this past season, we thank you for choosing John X Safaris as your choice destination in Africa. 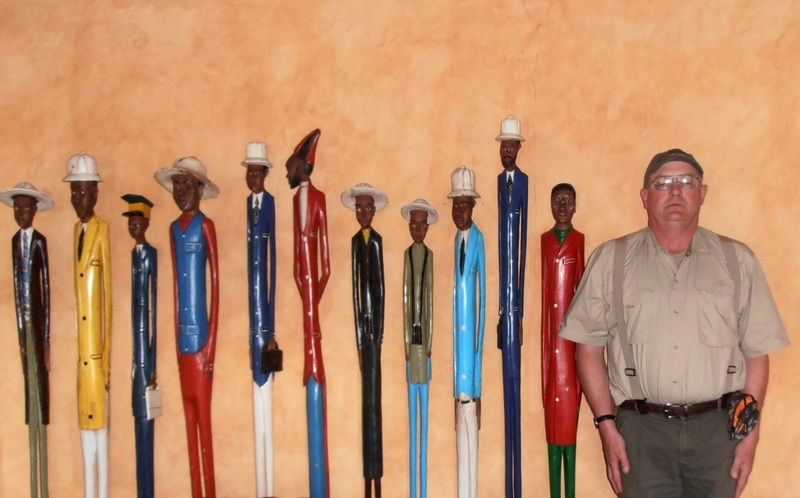 To those who will be returning, or are embarking on their first hunt with us during 2013, we look forward to the adventure and sharing our John X Safaris experience. 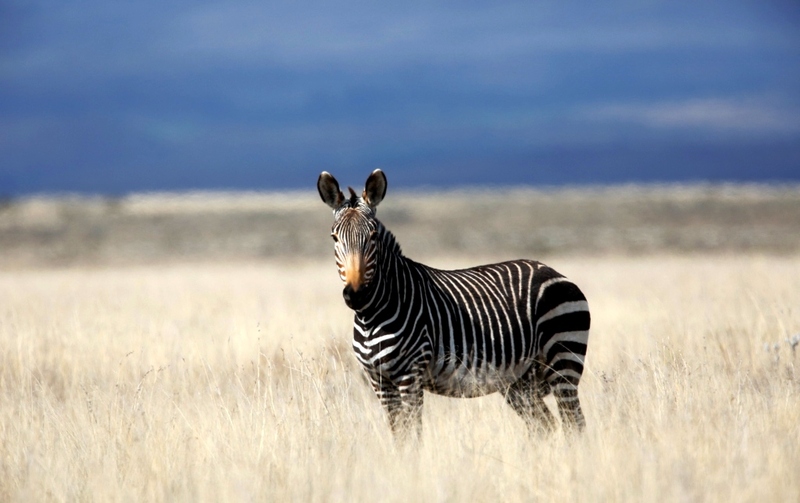 Please note – John X Safaris will be shutting down from 17 December 2012 until 1 January 2013. We will be checking mail on a weekly basis during the festive season.